DARKNESS, which researchers call the world's most advanced camera, will be able to directly image planets orbiting alien stars. The camera, called DARKNESS (the DARK-speckle Near-infrared Energy-resolved Superconducting Spectrophotometer), relies on extremely sensitive superconductor detectors to gather light from distant worlds. But semiconductor sensors, Mazin said, have certain limitations that make it difficult for this technology to image faint objects — such as distant stars and planets in their vicinity — a problem that he hopes the novel technology in the DARKNESS camera, based on super-conducting detectors, will solve. "When a single photon with the energy of more than 1 electron volt hits a semiconductor detector, it frees one electron," said Mazin. "In a superconducting detector, it frees something like 5,000 or 10,000 electrons. And since there are many more electrons to measure, we can do things that you can't do with the semiconductor detector." DARKNESS' new technology, called microwave kinetic inductance detectors (MKIDs), works at extremely low temperatures, only a tenth of a degree above absolute zero, said Mazin. The superconductor, made of platinum silicide, acts like an inductor, an electrical component that stores energy in a magnetic field, and works in conjunction with a capacitor, which stores energy in the form of an electric field, to form an oscillator, an electric circuit that can detect signal at a particular frequency. When a photon hits the superconductor, it "shifts the resonance frequency of the oscillator," said Mazin. "We measure this shift to determine when a photon comes in and how much energy it had." Thanks to its sensitivity, the 10,000-pixel DARKNESS camera enables the direct imaging of planets in the vicinity of nearby stars by detecting the light they reflect. The famous exoplanet hunter the Kepler telescope relied on an indirect method, called the transit technique, which detects the dip in the star's brightness as a planet passes in front of it. "The transit technique is great, but you need to have a perfect alignment of the planet and the star to see it transit," said Mazin. "Only about 1 percent of stars show transits. They are very rare." Another indirect technique for detecting exoplanets measures changes in the radial velocity of the star — its tiny wobbles — and the influence of an orbiting planet. The direct-imaging technique used by the DARKNESS camera, could, Mazin said, be the most versatile planet-finding process. "It actually takes a picture of the star and the planet," said Mazin. "You can [even] get a spectrum of the planet, but it's extremely technically challenging." 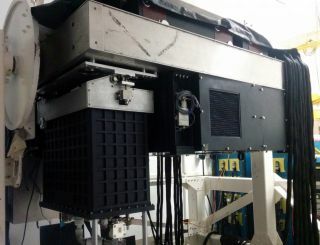 The camera has so far been tested in four runs on the 5-meter (16 feet) Hale telescope at the Palomar Observatory near San Diego. Mazin said the biggest obstacle the instrument needs to overcome is the Earth's atmosphere, which causes the twinkling seen in stars. "We are trying to look for a tiny, little point of light right next to a bright light, and the atmosphere just blurs it all into one giant blob," said Mazin. "We are using an adaptive optic system, which is a rubber mirror and a wave-front sensor, which measures the atmosphere and changes the mirror 2,000 times per second to take out that atmospheric distortion." Later this year, the researchers plan to deploy an even larger, 20,000-pixel camera on an 8-m (26 feet) telescope at Mauna Kea in Hawaii. "Going from a 5-m to an 8-m telescope is a big improvement in what you can see," said Mazin. "Mauna Kea is the best site in the world for this kind of work, and we hope that the 8-m telescope in combination with a very powerful adaptive optic system will allow us to start finding more planets and for the first time start seeing planets in reflected light." Mazin said he hopes the technology will be used in the future 30-m (98 feet) telescopes, which will be powerful enough to read the spectrum of the reflected light from exoplanets around nearby stars and look for signatures of life in those worlds' atmospheres. Super-conducting detectors have previously been used in sub-millimeter telescopes and telescopes measuring cosmic microwave background; however, scaling them up has so far been challenging, said Mazin. The new work was detailed in April in the journal Publications of the Astronomical Society of the Pacific.